2 Blades enter, 1 Blade leaves. That’s the premise behind a series of posts I’ve had sloshing around in my head for years now. A series of “vs” posts where I pit 2 knives against each other to see which blade comes out alive. And when it comes to a knife showdown, I can think of no lower hanging fruit to start with than the Benchmade Griptilian and the Spyderco Paramilitary 2. Given that today is Superbowl Sunday, think of this as the “Knife Superbowl”. These are 2 modern classics. 2 benchmark larger EDC blades with loyal followings from top shelf manufacturers. Both easily made their way to my best EDC knife page, and both are responsible for launching the knife addictions of thousands of people. So which knife wins in a head to head battle? There is only one way to find out. Both are larger EDC knives. I suppose they could both be pressed into that nebulous “tactical” category as well. In my mind, the biggest difference between the two is the thickness of the handle. The Griptilian’s handle is almost a quarter inch thicker. The Para 2 comes with a fully flat ground leaf-shaped blade. No recurve, no serrations, no swedge. Just pure satin finished (or DLC coated) steel. The blade is ground reasonably thin, and offers a good balance of slicing performance and durability. The Griptilian comes with a high flat ground drop point blade. There is a swedge that creates a fine tip, and the knife comes with or without serrations. Once again the blade is ground reasonably thin, and provides a balance of good slicing performance and durability. Benchmade also offers the Ritter Griptilian, which is a wider blade. It has more of a belly and is ground slightly thinner. I have one and think it’s a little better than the standard Griptilian blade. Both the Paramilitary 2 and Griptilian have simple functional blades that cut well yet offer the end user decent toughness for harder use applications. Personally I think it’s a toss up between the two, and it will boil down to your personal preference more than any competitive advantage. The standard Para 2 comes with a S30V blade. The standard Griptilian comes with a 154CM blade. Both knives are offered in other steels. The Para 2 has been released in a myriad of sprint runs, with every type of exotic steel imaginable. The Griptilian has had some limited releases over the years, but is commonly offered in S30V. S30V holds an edge slightly better than 154CM, while 154CM is slightly easier to sharpen than S30V. Both 154CM and S30V are fine working steels in my book, so I would not favor either knife simply for the blade steel chosen, although it would be fair to argue S30V is the superior steel. Winner: Paramilitary 2, although it’s damn close in my book. The Paramilitary 2 features a G10 handle with nested steel liners. The Griptilian features a FRN (plastic) handle with nested steel liners. In late 2015 Benchmade finally announced that they are issuing the Griptilian in G10. These G10 handled Griptilians are apparently going to retail for a little under $200, which is quite steep. I haven’t acquired a G10 Griptilian yet, so for now I am going to limit my discussion to the FRN version. If you read or watch nearly any Griptilian review, at some point the reviewer will gripe about the FRN handles. They are lightweight, and “plastic-y” feeling. It has never really bothered me, but I realize that people prefer G10 over standard plastic and it’s considered a more premium material. The Griptilian handles are also somewhat bulky, and it creates for a thicker knife. This feels better in hand, but it takes up more space in the pocket. Fit and finish of the handles are basically on par. Both knives are made in the USA. I think the finish work is slightly better on the Griptilian, but both are screw together designs with partial stainless steel liners. The Para 2 has an open back / pillar construction design, while the Griptilian has a closed back design. Most people find open back designs to be preferable, as they are easier to clean. Personally, I prefer a thinner handle, I prefer G10, and I prefer an open back design, so I will give the handle construction to the Paramilitary 2 over the standard FRN Griptilian. Both the Griptilian and Paramilitary 2 have reputations for being comfortable working knives. Both feature spacious handles that allow for a full grip for normal people. Both knives feature textured handles with thumb ramps and jimping on the spine, providing plenty of traction to the end user. There are some differences between the two knives in hand. The Griptilian features a fat handle and is supremely comfortable. The Para 2’s handle is thinner and boxier. It’s still comfortable but I think it is less comfortable than the Griptilian. However, the Paramilitary 2 features a forward finger choil (or “50/50” choil). I really like forward finger choils as it gives the end user more options in using the knife. You can choke up for detail oriented tasks, and choke back for cuts that need more leverage. The Griptilian does not have a 50/50 choil and can basically only be used one way. For extended cutting tasks I would pick the Griptilian, however, the Paramilitary 2 is more versatile. That said, I have carried and used both knives for years and think this is largely a toss up that will come down to personal preference. Both are capable of getting work done. Winner: Para 2, but again, damn close. Both the Paramilitary 2 and Griptilian feature large “spoon style” pocket clips. Neither have ultra deep carry clips. Both clips are stainless steel. The standard Para 2 comes with a satin finished clip and the standard Griptilian comes with a black coated clip. Both clips are strong. Both knives bury decently low in the pocket. The Para 2’s handle is drilled and tapped for 4 way ambidextrous carry. The Griptilian’s handle is designed for ambidextrous tip up carry (2 way carry). Both knives are lightweight for their size and are easy to EDC for their size. There are certainly smaller more EDC friendly options out there, but if you are looking for a knife with a ~3.5″ blade, there are few options I can think of that carry better than a Para 2 or Griptilian. However, I think the Para 2 carries slightly better thanks to its flatter handle. The Griptilian is a lightweight knife, but it’s thick and you will notice it more in the pocket. Because the Para 2 is materially thicker and offers 4 way carry, I am giving this round to the Para 2. Both knives are manual action (non spring assisted) folders. The Griptilian comes with thumb studs (shown) or a thumb hole. The Para 2 of course comes with a thumb hole. Both knives are easy to open and are equipped with phosphor bronze washers. Both knives can also be opened with gravity by manipulating their locks. 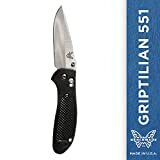 You can argue that a thumb hole is superior to thumb studs (and from a purely practical point of view, I would agree with that), but since Benchmade offers the Griptilian in both configurations I don’t see either knife being a clear winner. The Paramilitary 2 features a compression lock, and the Griptilian features the axis lock. Both locks are similar in that they are located near the back of the handle, can be manipulated with one hand, and it’s possible to close the blade without getting your fingers in the way. I think both locks are equally strong, although my guess is based upon their respective builds the Para 2 is a little stronger with its near full stainless steel liners and G10 handle scales. Personally, I prefer the axis lock as I think it is slightly less fiddly to use than the compression lock (especially as a lefty), but that is my personal bias creeping in. For all intents and purposes I’d say this category is basically a draw. Winner: Draw – although I prefer the axis lock personally. Money is the great equalizer – or so they say. I know that Tony has equalized for price on his knife shootouts, and I think it’s important to do. The Para 2 is considerably more expensive than the Griptilian. At the time of writing this article the Griptilian retails for around $90, while the Para 2 comes in around $125. So the Para 2 is about 35% more expensive than the Griptilian. Is the Para 2 35% better than the Griptilian? That’s a tough question to answer and I’ll try to consider it in my final thoughts. I would say that the race between the Griptilian and Paramilitary 2 is a close one. Where the Para 2 distances itself from the Griptilian is in the handle. It’s thinner, and is made of G10 vs. plastic. This results in a knife that is easier to carry, and is generally considered to be of higher quality. Other factors in favor of the Para 2’s is the use of S30V steel (widely regarded as superior to 154CM, although practically speaking I don’t think you will notice a huge difference) and the fact that the clip is a “4 corners” clip (vs. Benchmade’s clip only having 2 positions). So I think you can objectively argue that the Paramilitary 2 is the better knife here. That said, the Para 2 is also 35% more expensive, so you have to determine whether the thinner handle, better materials, and 4 way clip are worth the price premium for you. Personally, I think the Para 2 is worth the extra money, but when you factor in the added price the fight between the Para 2 and Griptilian gets very close. When you consider the premium in price, the real winner here isn’t so clear. But no one came here to see a draw, so I’ll declare the Para 2 the champion. I think that the upgrades are worth the increase in price, and ultimately that leaves you with a better knife. Still, the Griptilian is no slouch and remains one of my favorite EDCs of all time. I have carried and used both of these knives for years, and neither will be leaving my collection. I am guessing that a number of people reading this article will say “What about the new G-10 551 Griptilian?” That is a valid question. The G-10 Griptilian addresses many of the quibbles that I have pointed out about the original Griptilian (the plastic handles, closed back design, lack of a deep carry pocket clip, etc). At the time of originally publishing this article, the G-10 Griptilian just hit the market. I picked one up and wrote a review on it in May of 2016. It is an awesome knife, and Benchmade did a great job with it. All things equal, I like it more than the Para 2. However, at close to $200 the G10 Grip is almost $100 more than the Para 2. At that great of a price delta I would hope that it beats out the Para 2, and it meets those expectations. I think a more interesting comparison is the G-10 Grip vs. a Sprint Run Paramilitary 2. If you compare the G-10 Griptilian over a Sprint Run Para 2 with super steel, I’d go with the G-10 Griptilian. The machined handles of the G-10 Griptilian are amazing, and all of the other subtle refinements with the new Griptilian make it a much nicer knife than the Para 2 – even a Para 2 with upgraded blade steel. I’d rather have a blinged out G-10 Griptilian than a Para 2 with super steel and no other upgrades. So there you have it, the Paramilitary 2 vs. the Griptilian. This was actually pretty tough. The Para 2 wins here, but when you adjust for price it could slide either way. Let me know what you thought of this “vs.” article and whether you want to see more of this. If so, what knives should I pit against each other next? And as always, if you are considering buying a Paramilitary 2 or a Benchmade Griptilian, I recommend purchasing them at Amazon or BladeHQ. By purchasing things through any of the links on this website you support BladeReviews.com, keep the website free of annoying banner ads, and help produce future reviews. Thank you very much. Loved this article, I guess to have the basics covered it would be fun to see a budget shootout, a hard use shootout, and maybe a survival “chopper” shootout. I usually enjoy seeing what people pick as the contenders more than necessarily what the winner is. No losers get brought to the table so being in the running is endorsement enough in my mind. Good point – hadn’t thought of it that way, but that is well worth considering. I have a few ideas swirling around… I appreciate the feedback. This format is good. I definitely think you should do a comparison for budget knives, hard-use knives, and also a smaller knife shootout(roughly Dragonfly 2-sized). Thanks Patrick. I will try to write more comparison style articles. The feedback has been great so I will definitely run with it. Thanks for stopping by. I was not aware that the Axis lock was significantly stronger than the Compression lock. If that is the case then I would agree that puts the Axis lock even further over the edge in my book. However, in the role of an EDC blade most people will never test the limits of either lock so I am not sure how significant of a role lock strength would play into the analysis. Still an interesting point for sure, and all the more reason to lean towards the Axis lock. The axis lock may be stronger, which for EDC is like saying the Corvette is faster than a Prius so that makes it better for a rush hour commute. But it also has more parts that can fail, and it is also harder to clean. The open-back construction and compression lock make the PM2 easier to clean overall, and the SpyderHole and comp. lock are probably together easier to manipulate than the little Axis studs, especially with covered hands. Personally, I’d rather have the compression lock. Also, as an aside, I don’t take anything that Cold Steel has to say without a massive grain of salt. The comp. lock is one of those I hear most about “almost as strong as a Tri-Ad”, and it’s a less-generic(liner, frame, lockback, etc) lock from a major competitor, so if there’s a lock CS is most likely going to want to have fail, it’s probably that one. Great points regarding the axis lock vs. compression lock. You are right about there being more parts / higher potential for failure with the axis lock. Also, I have seen the axis lock not respond favorably to spine whacks (not that I do that), and the handle of the Grip is mostly plastic, so I think strength is relative to your needs and applications. I own both as well but I have the 550 HG Griptilian with the modified sheepsfoot, hollow ground blade with the Spyder-hole. It’s very close for me too I love them both. But for rougher use I tend to go for the Griptilian. The modded sheepsfoot design is far superior to the regular version in My opinion. The price is so close given its only 30.00 difference that doesn’t factor for me. The Griptilian with the thumb hole is a tough knife to beat. The practicality of a Spyderco with an axis lock, nice hollow grind, and 154CM steel. It’s just a workhorse of a knife. Enjoy yours in good health and thanks for taking the time out to read the article and comment. Thanks for the feedback.Those are some good pairups. I was thinking of comparing the Mini Tuff Lite with the Dragonfly II as they are very similar, only I have misplaced my DF2. Haven’t handled a Nano but that might be a better pair up. And I like the Sage 1 vs ZT 0770 – the 770 is a knife I have been curious about for a while, and of course the Sage 1 never strays far from my pocket. Thanks again. Great review but would you be able to compare the new g10 griptilian? I believe it is the 551-1. Hi Alan, I did touch on the G10 Grip in the article. I’ll be able to comment further once I buy one. Love the new series and can’t wait to see more. I too find myself comparing different knives in my collection on occasion. I have both a Para 2 and a REI special edition g10 Griptilian. Both wonderful knives, but I still prefer the Para 2. The 50/50 choil and the fact that, in my use, Spyderco’s cpm s30v holds an edge better and sharpens more easily than Benchmade s30v make it an easy decision. The Griptilian is more fun to play with though. Thank you, Bill. I’ll definitely cook up some more “VS” posts (and maybe a shootout of some sort as that has been asked for). The Para 2 is a tough knife to beat. Glad you enjoy both. What about the Benchmade 940 vs the Spyderco PM2? Those are two blades I often hear compared to one another? Sure that could be another great match up. I had never been a fan of Spyderco’s mainly because I didn’t like the way they look. Then I ran across a deal on ebay I couldn’t pass up and only bought the PM2 because I figured I could double/triple my money on it to use towards my Kershaw/ZT collection (seller had no idea what he had, listed it as a new Kershaw Leek with a Buy It Now price of $29.99…). When I got it in the mail and played with for just a few minutes I fell in love and it hasn’t left my pocket since. Like many here, I also love the Griptilian but I have to say my PM2 beats it hands down. It opens as fast as any assisted or switchblade and it’s so smooth it will fall shut with a push of the lock, no manipulation required. You are very kind – thank you. For $30 I would have checked that PM2 out as well – nice score! The Para 2 is one of Spyderco’s best IMO. Right up there with the Sage 1 and Dragonfly 2 for my favorite Spydies. Enjoy yours in good health! The Sage is now 2nd on my buy list, I did get a deal on a Dragonfly 2 and it’s a great knife although I’m not a big fan of lockback knives. Since I’m new to Spyderco’s I really don’t know enough about them (yet) to have a intelligent conversation except to know a great knife when I see/feel one. I just ordered a Manix 2 I haven’t received yet and the Domino is next. After the Sage, there is the Rubicon, Mantra, Pingo, Starmate Southard…..I need a second job! Something else I’m excited about, I’ve always wanted to customize a knife, since I got the PM 2 so cheap and I really don’t care for the digital camo, I figured this would be the time so I ordered a set of custom Desert Ironwood scales. Can’t wait to get those. Thanks for the good work, Dan, I’m loving your site. -I have owned three separate Griptilians, one 551 standard (satin, plain edge, black, thumb stud), one 550HG from the BM custom shop in S30V (satin, plain edge, thumb hole), and one 551 in D2 from Cabela’s, and all three had fairly significant blade play that I could not fix by adjusting the pivot, even using BM’s own “Blue Box.” Given the fame of the Axis lock and the price point that these knives fall into, having a blade that wiggles side-to-side by simply shaking the handle vigorously (I kid you not, on all three) is unacceptable to me. -The above having been said, Benchmade has one of the fastest, fairest, and most communicative customer service/repairs departments in the business, second only to maybe Kershaw/Kai USA. Sure, they may not have been able to keep my knives from feeling like they were going to close in a stiff wind, but they were very open and friendly through the whole process, and have sent me many a pocket clip free of charge, while the same cannot be said of my beloved Spyderco. For all that I love my Spydies (they make up most of my collection and rotation), getting parts or repairs is both costly (when compared to ‘free’), and about as easy as pulling teeth from an un-sedated, ADHD six year old. Still gotta give it to the Para 2, though perhaps the Manix 2 LW (CTS-BD1 or CPM-S110V) would be a more apt comparison given price point and construction…? I know S110V blows 154CM out of the water, but BD1 probably gets close. Hate to harp on a good thing though man, thanks for taking the time and offering a reasoned, experienced opinion. Thank you for the comment and kind words (and sorry for the slow reply). I am sorry to hear all your Grips had significant blade play. Mine has a little, but not when you simply shake it. The Manix 2 would probably be a closer comparison (and maybe the subject of a future showdown? ), but the Para 2 is such a popular knife I figured that would be the best starting point for this series. Thanks again for stopping by and sharing your thoughts. As someone who owns both a G10 griptilian and a sprint run paramilitary, I have to to say that they’re near impossible to choose between. The paramilitary definitely has the edge in ergonomics; that said, the griptilian’s fit and finish is in another league and makes it obvious that it costs nearly $200 (I paid about the same for both). Since I can’t choose, I just EDC them both on alternating days. Thank you, Adam. Yeah, this is a tough choice, and any self-respecting knife nut will eventually have both a Griptilian and a PM2 enter the collection at some point. At the very least to check them out and see what works best for them. Personally, they are all staples to my collection and won’t go any time soon. I just recently bought the 551-1 g10 with the black coated blade and I just love to look at it the fit and finish are so good and the grey g10 with the blue accents w/the black blade best looking knife ive ever held.Having said that, until now i was carrying the blurple para 2 with S110V steel and felt the same way about it and still do . To me you cant pick one of these knives over the other just depends on what mood you are in that day . I also think in that price range they are the single best two edc knives on the market there isnt a knife out yet that i want to buy that I think compares . And i have owned several benchmade, spyderco,kershaw ,cold steel . I just want to add one more thing for the veiwers that you dont have to spend $200 to have a great knife both the orginal grip and para 2 are great and really fun knives for edc. Thank you for the review i really enjoyed it especially since my new purchase of my upgraded grip.